Well, things are a little crazy around here (in a good way) as Louisville gets ready for the start of the two-week-long Derby festival*! So, while I'm getting ready to watch some fireworks, here are some links for you to enjoy. First of all, I kind of can't believe that more people aren't talking about this (unless maybe it has all of us skittish about Tweeting...). 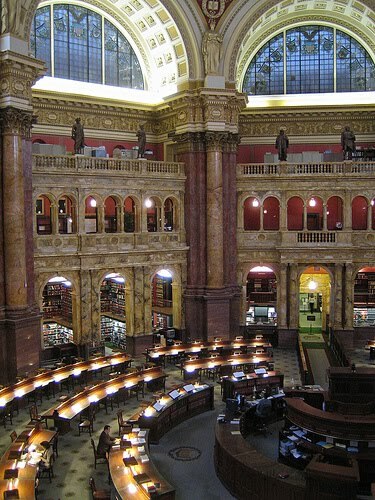 The Library of Congress has acquired the Twitter archive. Like, the whole thing. Preserved for all time. Those tweets about your breakfast? The tweets when you were grumbly about work? Or when you were excited about a TV show about to start? Preserved for all time. Your children's children's children could find them and read them 100 years from now. It's kind of blowing my mind. And making me ever more conscious that the stuff we put out here on the interwebs? It's for keeps. Thanks to Kelly for the link. Betsy of A Fuse #8 Production announced the top book in her Top 100 Children's Novels poll this week! What a great list for collection development and professional development! Library students and new children's librarians take note - this is a great starting point for broadening your knowledge of children's literature!And Travis of 100 Scope Notes helps us visualize it, too. Not to be outdone, Persnickety Snark is compiling a Top 100 YA Novels poll. Let's spread the word on this one, eh? You have two weeks (votes are due April 30) to figure out your top 10 YA novels and submit them for the poll. In the category of Very Exciting News, our own Jen Robinson and her hubby welcomed Baby Girl into the world earlier this month! Mom and Baby are both doing fine. Go on over to Jen Robinson's Book Page and wish her well! Are your teens singing songs from Glee as they peruse the stacks? Why not hand them a Glee readalike list, such as this one compiled by Sarah of GreenBean TeenQueen? Pam (of MotherReader) snuck it in there with a bunch of other tidbits (kinda like I am doing right now, eh? 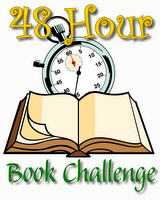 ), but I'm so excited that I ferreted it out: The 48 Hour Book Challenge will be back June 4-6, 2010! I know I've got a program on the fifth, but will that stop me? Noooo! In fact, I'm already mentally compiling a list of books that would be good to tackle that weekend. And this year, with my trusty new couch, I shall be unstoppable!! And hey, if you're not checking out The Story Siren's Books to Pine For feature, you might be missing out. She's super duper on top of the new YA books coming out and I always find books to add to my wishlist. I consider myself fairly on top of the YA lit scene, but Kristi's really amazing. Definitely worth a look. *You know, the Kentucky Derby? Horse race? Mint juleps and fancy hats? "And DOWN THE STRETCH THEY COME!!!"? Yeah. It's a pretty big deal here. Oh dear, June 5 is the big garage sale days here in town. There goes the morning. Oh well, it might be nice to break up the reading. Thanks for mentioning the LOC/Twitter news. You kinda blew my mind as well, thinking about future generations reading our tweets. Crazy to consider how mindless it will probably seem. "Oh, it looks like great great grampa Scope Notes enjoyed a delicious Drumstick ice cream cone on April 16, 2010". We all know Twitter can be pretty silly, but the idea that it will be preserved definitely heightens that feeling. This online permanence is crucial knowledge, especially to kids - I need to stress it more to the students I work with. I'm now off to make that Tweet above a reality. Thanks for the great links! I just went to Adele's post and added my 2 cents for the Top 100 YA. 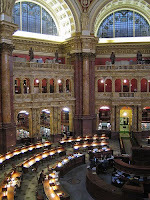 Thanks for yet another roundup of great links ... gee, I guess I should tweet my thanks too, then we can BOTH be in the Library of Congress. That totally blows my mind.